On Thursday, the United Kingdom held the game-changing Brexit vote to decide if it would remain a part of the European Union. Of those who voted, 51.9 percent cast their ballot for exiting the EU, and a domino effect of not-so-great events has already begun. Not only is Britain's financial sphere in panic mode — and the U.S. stock market isn't doing so hot, either — its leadership has been upended. Now, not only is Britain reeling after being ripped from the EU and the subsequent economic uncertainty, but they're also losing its prime minister. As he vowed would happen in the event of a Brexit affirmation, David Cameron is stepping down after the vote didn't go his way. Cameron campaigned hard for citizens to choose to remain, warning of economic turmoil. But after the unfavorable result, he's set to resign come October, after six years of leading the united Kingdom. In an emotional speech outside his 10 Downing residence, Cameron said, “The will of the British people is an instruction that must be delivered” and called for "fresh" leadership. Nicknamed BoJo by the press, which has often has a field day with his antics, Johnson is known for making reckless and offensive comments, like declaring Papua New Guinea a nation known for "cannibalism and chief-killing" (he later apologized) and saying women go to college because they "have got to find men to marry." A politician with bombastic and offensive rhetoric? Sound familiar? We're not the only one who're noticing an overlap with presumptive GOP nominee Donald Trump. 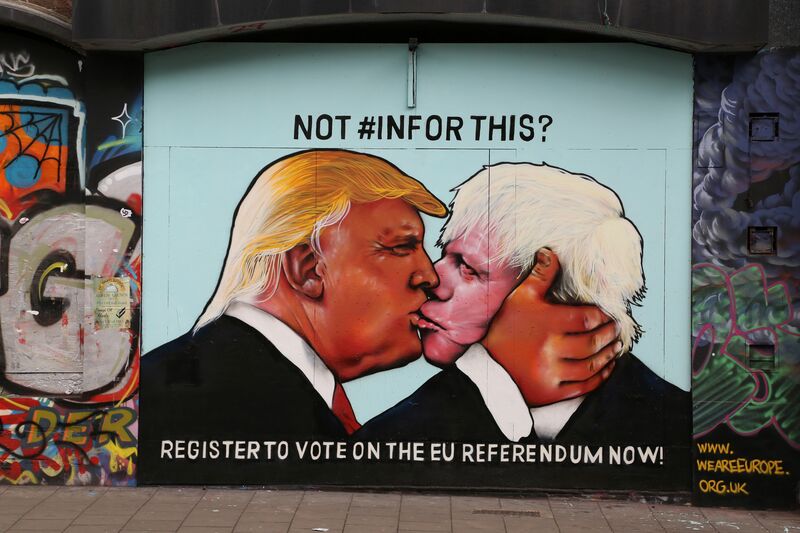 It's not surprising there's 15-foot mural that went up in Bristol, England displaying Trump and Johnson in a passionate embrace. More recently, comic book artist Matt Wilson's tweet captioned "The Nationalist Xenophobe Look" went viral, comparing Trump, Johnson and the famously anti-Islam Dutch politician Geert Wilders in this uncanny side-by-side match-up. Looks aren't everything, but in this case... they're not nothing. Trump seems to be shamelessly welcoming the comparison, cheering on the possibility of BoJo as Cameron's replacement, saying Johnson "got it right" by spearheading the Brexit movement and alluding to the parallels of the type of political unrest and desire for change in the United States and the United Kingdom. But there's hope beyond BoJo: The other PM replacement hopefuls potentially throwing their hats in the ring are Justice Secretary Michael Gove, Finance Minister George Osborne, Home Secretary Theresa May, Work and Pensions Secretary Stephen Crabb, and Scottish Conservative leader Ruth Davidson.